Tenor Giuseppe Filianoti had tremendous run of “La Clemenza di Tito” in November, but his performance in Friday’s “Rondine” was among the best I have heard him deliver on the Met’s stage. The 39-year old tenor (he was celebrating his birthday during this performance) possesses a bright sunny sound one usually associates with Italian singing. More importantly, Filianoti sculpts phrases like few others do these days; his legato is elegant and refined and his singing is always brimming with intensity and passion. The moment his Ruggero came on stage, it was clear that this was an inexperienced young man coming out into the world for the first time. At many times it felt as if Opolais’ mature Magda was a few years older than Filianoti’s Ruggero and this added an almost tragic inevitability to the opera’s conclusion. Filianoti came on stage with a mustache that almost reminded one of Charlie Chaplin, his eyes wide open as he looked about the lavish home of Magda as if he had never seen such riches in his life. As he delivered his aria “Parigi! È la città dei desideri!” he sang with boyish enthusiasm and even added a comic touch as he signaled for the attention of the other characters onstage. Like Opolais’ Magda, Filianoti’s Ruggero is also coming to terms with emotions that he has maintained under control. 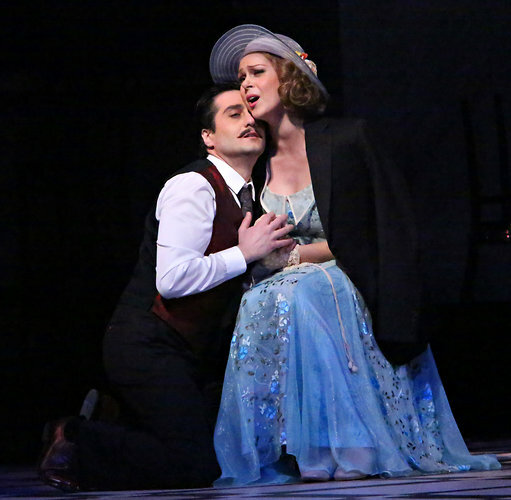 When Magda asks him about love in the second act, Ruggero responds that if he were to love, it would be forever. Filianoti delivered this line with some initial aggressiveness as if he were repressing a bad love experience. But he slowly let his guard down and by the time he was singing the ensemble “Bevo al tuo fresco sorriso,” every phrase was embraced with tenderness that eventually blossomed into a thrilling High B flat at the apex of the phrase; he couldn’t control this new passion that he is feeling. Filianoti was even better in third act as his character delved deeper into fulfilling his romantic fantasy. At one point, he tells Magda that she is not his lover, she is love itself. Filianoti sang this phrase almost sotto voce, a quality that made the moment surreal. As Magda read his mother’s letter, Filianoti’s Ruggero enthusiastically uttered the words “Leggi,” as if he couldn’t wait for her to get through the letter and accept his marriage proposal. As she continued reading, he walked to other side of the stage and closed his eyes, completely enraptured by the thought of living the rest of his life with her. It shattered the viewer to watch their ensuing duet in which he begs her to not leave him. His “Ma come puoi lasciarmi” was not delivered with complete emotional abandon initially. Prostrated before her, he begged delicately, almost trying to hold in emotions and reason with her. But when she knelt beside him and told him it was not possible, Filianoti let loose his emotions and his voice rang through the lush orchestration with full-fledged intensity. At the end, he slumped over in a chair, crying desperately and then fell to the floor; watching Filianoti’s suffering coupled with his partner’s desperate attempts to soothe him made the opera’s finale one of the most wrenching moments I have witnessed at the Met. (Giuseppe Filianoti) has a melting sound that carries well and a feeling for Italianate style…He was at his best in the dramatic final episode of Act III, set at a hotel on the Riviera, to which Ruggero and Magda have fled, though they are running out of money. He wants to marry Magda, who finally tells him the truth about her past. Here Mr. Filianoti let go, pouring out his anguish and confusion. Giuseppe Filianoti was her naïve lover, Ruggero, styled as a 1920s matinee idol. A sensitive, heartfelt actor, he sobbed helplessly as she abandoned him in the last act. The role’s romantic melodies made a charming fit with his velvety tenor and easy legato.